Cisco's head of North American Partner Operations, Matt Brandt, oversaw over 4,000 Cisco partners that sold Cisco products through distribution channels around the world, but there was no tool for the sales reps to claim their sales for the purposes of incentives and quotas, and no way for the Cisco finance team to audit claims efficiently. Media Net Link created a web-based sales claiming tool that automated all of the steps for both sales reps and finance teams, creating a central repository of critical business data and a simple means of accessing the information from sites all around the world. Cisco’s partners immediately embraced the tool because it afforded them an opportunity to easily record sales that triggered incentives. 13,664 line items were processed in the first month of operation with no manual intervention. Cisco sales in the first year of using the tool were $500 million, a five-fold increase over the previous year. Staff cost savings were $500,000 per year, and workflow process was shortened by two months. The first year's return on investment was over 400%. Subsequently, Media Net Link was asked to develop the complete Cisco World Wide partner portal for all partner sales programs. 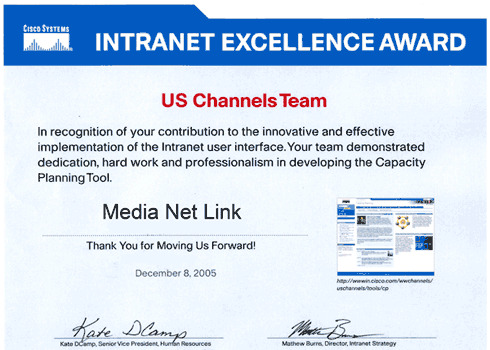 Congratulations to the US Channels Team! We are impressed with the dedication, hard work and professionalism your team demonstrated in developing the Capacity Planning Tool, which is one of the best implementations of CEC application templates we have seen to date. The development team demonstrated an amazing grasp of the standards and did a terrific job of leveraging the tools and services CEC has to offer to save development time. Your team engaged with us early in the process and acted as very responsive partner throughout. When Channels had needs which the current CEC standards didn't address, we worked closely together to create new standards and solutions. Importantly, these requests always reflected real user needs and a commitment to user-centric design. "MNL was instrumental in designing and building a web based solution for our sales incentive program. They worked closely with our in house IT staff to create a timely and cost effective solution. MNL's database and programming expertise were especially critical in integrating data from very large data warehouse repositories."